These photos were taken on June 1, 2017 at 1:11 PM. The location was in Rockville, Maryland. The "Take It!" came as I pulled into a parking place at a branch of my bank. The slot happened to be facing away from the bank and facing an outdoor display from a patio furniture store. I had been to this branch often, and once actually had gone into the furniture store to price an item. What made everything different this time, was the occasional gust of wind, which somehow just was at the right strength to catch the back of this rocker and made it rock. Because the wind was in gusts, it was able to move in a near regular fashion. 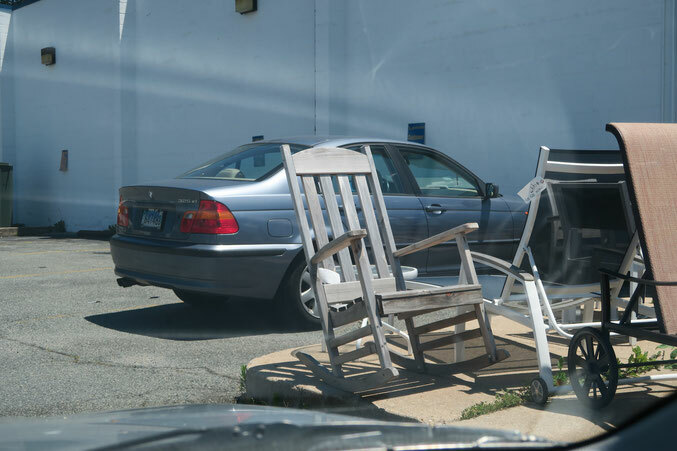 Needless to say, when I pulled up and looked out the front window of my car and saw this chair rocking, with no one in it - I had a double take. I grabbed my camera and took several photos of it, but none were able to show the rocking motion. The After Take: This entire story is in the telling. If there was a spirit there in the chair, they could not have picked a more pleasant day to enjoy themselves, and the occasional on looker. This was just too unbelievable not to pass along. Thanks for joining me, in the strange but treasured moment. Heh, I have a rocking chair very similar to that one. Aww that reminds me of my grand father. He spent so much time in his rocking chair, reading, sleeping, you name it. Hopefully spirits don't feel humidity. haha. 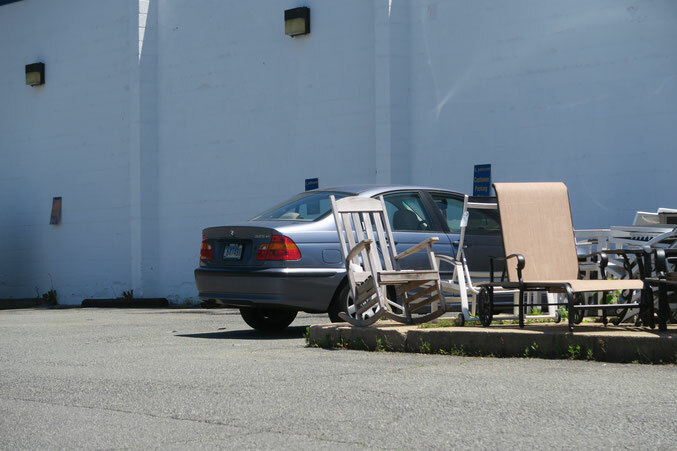 When I first looked I thought that's odd, a bunch of chairs just out in the parking lot? A furniture store makes much more sense though.